what do freedom fighters fight? Are you allowed to turn portable fire extinguisher upside down during an inspection? How volatile is an extinguisher after its been dropped (what are the dangers in dropping a fire extinguisher)? Does the Ansul dry chemical tank have to be hydro-statically tested on a vehicle mounted fire suppression system? Who can perform an inspection on a fire extinguisher? Are dry chemical fire extinguishers (ABC or BC stored pressure extinguishers) supposed to be removed from service if they were manufactured BEFORE a certain date? Are “K” Class extinguishers equipped with a wand type extension manufactured prior to January 1, 2002 supposed to be decommissioned (removed from service) or under recall? Can I use an ABC dry chemical extinguisher in a kitchen? What kind of extinguisher would you use in a kitchen? How often does a CO2 extinguisher have to be hydrostatically tested? Why is the pin on a fire extinguisher sealed? On most CO2 (Carbon Dioxide) fire extinguishers there’s a “full” weight and an “empty” weight. How much deviation is allowed from the “full” weight before it’s required to be recharged (or topped up)? I'm an RFPT employed in Vancouver. My company wants me to tag off on extinguishers that have a Hydro-test label on the shells where the company providing this service is not (and never has been) registerd by Transport Canada as a Cylinder Requalifier. What should I do? Is it legal for me to tag this extinguisher? Can a "UL" Listed extinguisher be serviced in Canada? What's the maximum mounting height for a fire extinguisher? Who can perform a hydro-static test on a fire extinguisher (in Canada)? Who can perform a six-year maintenance inspection of a fire extinguisher (in Canada)? Would you recommend one of those "mini" fire extinguishers for a home? How do you tell when a fire extinguisher is bad? How often must fire extinguishers be inspected (in Canada)? I'm an RFPT employed in Vancouver. My company wants me to tag off on extinguishers that have a Hydro-test label on the shells where the company providing this service is not (and never has been) registerd by Transport Canada as a Certified Cylinder Requalifier. What should I do? Is it legal for me to tag this extinguisher? Good question, and one that presents an interesting conundrum for a lot of your fellow service technicians. My first thought would be to say "NO" because any company that isn't Transport Canada Certified likely doesn't have the proper testing equipment to measure cylinder expansion (an important part of the actual testing criteria), while some companies are even "hydro-testing" out of the back of a van! The proper testing gear requires a significant investment and a good deal of floor space. Rather than a flat-out "NO", why not throw it (not literally) back at your boss (or service manager) for HIM to tag off on (don't forget to leave a proper replacement on site when you remove the suspect extinguisher though!)? Don't take the chance that a failure (which could happen almost anytime after you've hung your signed tag on it) is going to wind up "biting" YOU! If your employer is engaged in performing hydrostatic testing without the requisite Transport Canada designation, make darn sure YOUR SIGNATURE AND STAMP aren't anywhere near the thing. Remember, it's your stamp and your career on the line! As for the extinguisher's owner, I would insist that the company that applied the BOGUS HYDRO-TEST STICKER (and which also probably charged you for the service) have it properly tested by a Transport Canada Certified Cylinder Requalifier. NOTE: It's important for your employer to set the standard for the failure of an extinguisher which you might suspect isn't properly tested. You can determine whether-or-not a company is properly certified to perform hydrostatic testing by visiting the Transport Canada website! Interesting question. Technically "no" even though it's going to be serviced/inspected to the same standard US based fire service companies use (which happens to be NFPA 10). Believe it or not, this is a common problem we face in the Lower Mainland (Richmond, BC particularly since we're so close to the border). The issue is that we (technicians in Canada) can't service what we can't sell and if the fire safety equipment has a "UL" label, you can't sell it in any jurisdiction in Canada. If the extinguisher has a label with a "cUL" symbol, it would be perfectly acceptable for a Canadian company to service it but the owner could still be faced with the possibility of the local US AHJ rejecting the tag and requiring the equipment to be re-certified. The Province of Alberta has published an official Notice entitled Portable Fire Extinguisher Servicing which clarifies this subject for service companies in this jurisdiction. “6.1.3.8.1 Fire extinguishers having a gross weight not exceeding 40 lb (18.14 kg) shall be installed so that the top of the fire extinguisher is not more than 5 ft (1.53 m) above the floor. And don't forget one other proviso: You must maintain a clearance of at least 4 inches (102 mm) between the bottom of the extinguisher and the floor. NOTE: If the extinguisher is going to be mounted in a cabinet (or on a wall bracket), the mounting heights provided above must still be observed. The measurement to the top of the cabinet is of no consequence but you can safely assume the measurement to the bottom must be at least 4 inches (102 mm) from the floor. Who can perform a hydro-static/six year maintenance test on a fire extinguisher (in Canada)? NOTE: Unregistered agencies (or companies) which perform hydro-static testing service are doing so in violation of the regulatory authority. The application of a label similar to the one shown by such an unregistered company would render any such testing INVALID. 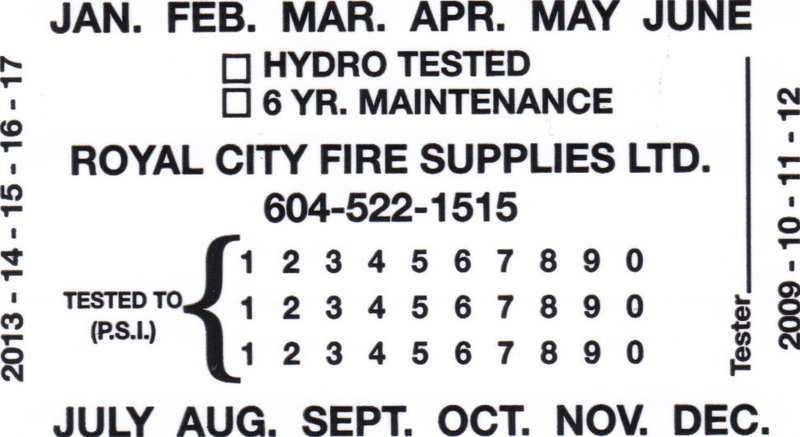 Tech Tip: If you are performing an annual inspection on a fire extinguisher, you must ensure that the company or agency whose name appears on the hydro-test/six year maintenance label (or whose stamped ID is on the neck of a CO2 extinguisher) is properly registered. If you find that this is not the case, you must arrange to remove the extinguisher from service and have it properly tested. I would not recommend any extinguisher for use in a home that didn't employ a gauge to indicate it's readiness-for-use (so that pretty well rules out most of the “mini” extinguishers currently on the market right off the bat). I would also suggest staying clear of pressurized extinguishers that employ plastic heads and/or operating levers. I recommend a good vehicle type bracket to secure your home fire extinguisher to the wall as it's too easy for young children to "bump" and knock off if it's on a standard type hook. Even a 2 and a half pound extinguisher can seriously injure if it happens to fall on a loved one's foot (I should mention that squishing the family pet won't be good either). I have several extinguisher types in my home. I prefer a 5lb. 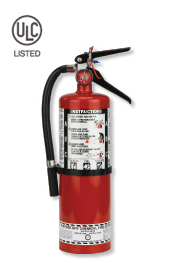 ABC rated extinguisher for general use. For my kitchen and barbecue I have "K" class extinguishers. Clean up of the latter is much easier and because it's a liquid agent it also helps to prevent something called "reflash", which is a danger particularly around hot cooking surfaces. As an alternative for the kitchen, I would recommend a 5 or 10 lb BC rated extinguisher. I have a clean agent extinguisher in my home office because the thought of discharging a dry chemical extinguisher into the same room that houses my server rack and colour printers is too horrifying to contemplate. It's a good idea to familiarize yourself with the proper methods of putting out common kitchen and household type fires. A number of helpful videos can by found on youtube (we actually reference one in this FAQ) or your local fire department's website and often involve a "common sense" approach that may not even require using a fire extinguisher (particularly when it comes to grease or cooking oil fires). You should also familiarize yourself with the care, maintenance and use of your particular type of extinguisher. The best way of dealing with a fire in the kitchen however, is to ensure one never starts. This involves exercising caution when working around your stove and keeping flammable items safe and secure. This question has a very broad answer because there are a lot of failure criteria and (in most cases) you have to be trained to know what to look for. The simplest indicator is the pressure gauge found on most common type fire extinguishers (illustrated in the previous question). The gauge usually has a green zone sandwiched between two red zones. If the indicator is in either of the red zones, your extinguisher is "bad" and requires immediate service. A number of extinguishers have a metal pull or safety pin that prevents an accidental discharge of the extinguisher when you're moving it or servicing it. If that pin is missing, it's "bad" and requires service. If, when weighed, the unit doesn't fall within the weight stipulated on the label, it's "bad" and requires service. If the cylinder has been damaged (dented, scarred, engraved, scored or deeply scratched), it's "bad" and, depending on the severity of the damage, might even have to be destroyed. These are but a few (and the most obvious) of the testing criteria. You should be looking for some of these every month if you're an apartment or building manager and performing the scheduled walkthrough of your project in accordance with your Fire Safety Plan. There is one other parameter you must check. Most common low pressure type extinguishers have to go through two mandatory maintenance tests which must be conducted by a properly registered service company. The first one occurs six (6) years after the date of manufacture, while the second happens after twelve (12) years (with the cycle repeating itself from each testing date thereafter). You can find the date of manufacture stamped into the bottom of the extinguisher or on the label affixed to it's shell. The first test involves properly harvesting the agent, examining its consistency, an internal examination of the cylinder, replacing the agent and re-pressurizing the unit. This is called a "six year maintenance". The second test is the hydro-static test which is explained in a preceding FAQ. Both tests (when successfully concluded) will result in a label being affixed to the cylinder which explains the type of test conducted, states the name of the certification agency, and provides the date of the test. According to the Canadian National Fire Code (which is adopted both Provincially and Territorially), extinguishers must be inspected as part of a monthly safety regimen (usually by the individual designated as a building's Fire Safety Officer), as well as yearly (normally performed by a trained technician as it requires affixing a new service tag to the unit). A currently dated tag (and attendant report) witnesses the fact that the extinguisher has been inspected in accordance with the requirements of NFPA 10 (which the Fire Code also refers to). If you examine the label on most extinguishers currently in service, you’ll see that the “full” weight of the unit is represented by a range from a “minimum” to a “maximum” allowable. The reason for this is to make allowance for slight deviations in the manufacturing process (shell construction, fittings, nozzles, etc.) If the CO2 extinguisher you’re servicing falls BELOW the minimum weight allowed by the manufacturer, then it must be recharged (topped up). NO EXCEPTIONS! The seal serves two purposes. It ensures the unit has not been tampered with since the last annual inspection or service. It prevents the safety pin from coming loose or falling out. Without the safety pin, the extinguisher is liable to be accidentally triggered or partially discharged. Every five (5) years because it’s considered a high pressure cylinder. To find a properly qualified Cylinder Recertification Agency, you can search the Transport Canada website! Can I use an ABC dry chemical extinguisher in my home’s kitchen? What kind of extinguisher would you recommend for a kitchen? As you can see for this rather dramatic video, a pan fire can very quickly get out of hand. As for our recommendations for a kitchen general purpose extinguisher, I would suggest a “K” class type (which would also be good around the barbecue)! More information is available in this FAQ. Notice what it doesn’t say. It doesn’t say they should be removed from service. If the extinguisher was manufactured prior to January 1, 2002 and is serviceable (meets the other criteria in NFPA 10), then there is no reason to remove it. NFPA 10 (issued from 2007 onwards) requires the removal from service of any dry chemical stored pressure extinguisher manufactured before October 1984. The latest edition of the Canadian National Fire Code (2012) (adopted by British Columbia in December, 2012) references NFPA 10 (2007) but specifically excludes sentence 4.4.1 which essentially means their removal is not required. Please ensure you check with your local jurisdictional authority! Practically anyone. Seriously. It doesn’t take a rocket scientist (or paid technician) to perform a visual inspection of a fire extinguisher. How can I justify a “no” answer when NFPA 10 (2007) so clearly identifies that a CERTIFIED individual must perform this inspection in Sentence 7.1.2.1? In Canada, there simply isn’t an agency that provides external inspection certification of fire extinguishers. The only time “external inspection” is mentioned is in CAN/CSA B339-08. So what’s a fire extinguisher test / inspection all about? You should be doing this at least once a month (more often if it’s vehicle mounted). What do you look for? Is the gauge in the green zone? Is the label properly attached/missing/defaced? Is the pin in place and the seal holding it unbroken? Is the handle bent or damaged? Is the hose damaged/properly attached? Is there an excessive amount of corrosion on the bottom or sides of the cylinder? Is the annual inspection tag legible? Lift it off its bracket and check the date on the bottom of the cylinder. If it’s older than six years and hasn’t been serviced, then you should arrange to have this done. Turn it upside down and listen for the powder to drop (this could be difficult to do if it’s a larger extinguisher - use common sense and don’t attempt to do this by yourself if the unit weighs in excess of 20 pounds). Don’t attempt this if the unit is wheeled (or carriage mounted). It should flow in one smooth movement. If it doesn’t, it’s clumped or caked. With the cylinder upside down, tap the bottom and sides with a rubber mallet until you hear the powder fall. You may have to perform this operation frequently if it’s vehicle mounted. Vibration tends to pack the powder and you want it to be nice and loose. Congratulations! You’ve just inspected an extinguisher! If the cylinder happens to be of the low (or high)-pressure variety, then definitely YES. Follow the manufacturer’s guidelines for the proper maintenance and inspection of the equipment. You can access the manufacturer’s website from either our Bulletins or Links page! 2. report the incident to your immediate supervisor (who should place a call a reputable fire equipment service company to deal with it). It’s crucial that the cylinder be inspected to ensure it hasn’t been deformed, dented, or otherwise damaged. It’s also important to determine if the head, gauge, operating lever, or carry handle haven’t been damaged and that the seal around the neck is intact (and not leaking). Are you allowed to turn portable fire extinguisher upside-down during an inspection? We would be disappointed if you DIDN’T “turn it upside down during an inspection”! This is a key element in the testing of portable fire extinguishers. On your typical 5 lb. ABC unit that employs a powder extinguishing agent, put your ear to the centre of the cylinder as you turn it upside-down. The powder should flow in one long easy sound. If it doesn’t, *gently* hit the bottom of the cylinder with a rubber mallet. The powder has to be nice and loose for the extinguisher to operate properly. In point of fact, any vehicle mounted dry chemical extinguisher should be inverted on a weekly basis to ensure the powder doesn’t “cake” or solidify. Please review our FAQ on inspecting a dry chemical portable extinguisher!